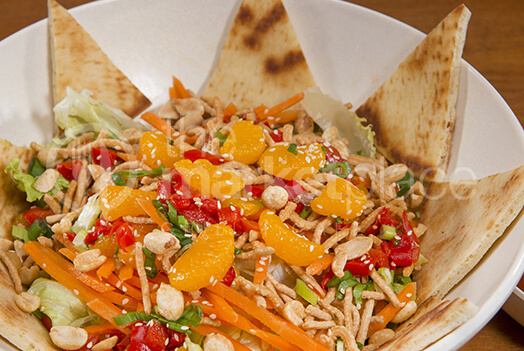 Shredded Iceberg Lettuce, Carrots, Fire Roasted Red Peppers, Chopped Green Onions, Wontons, Mandarins, Roasted Sesame Seeds, Roasted Peanuts, Grilled Pita Bread, And A Side Of Soy- Ginger Asian Dressing. Veggie – Grilled Asparagus, Broccoli, Mushrooms, Squash, Zucchini, Bell Peppers. Quinoa (Hot Or Cold) – Tri-color Quinoa, Asparagus, Roasted Red Peppers, Sliced Almonds, Sheep’s Milk Feta Cheese, Green Onions Topped With Parsley, And Accompanied With Sweet Mustard Dressing.